This Holiday Season, treat your family and friends to a gourmet feast! 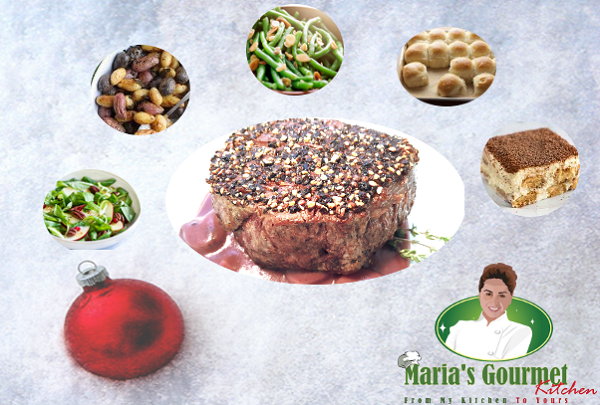 This delicious, chef prepared Filet Mignon steak dinner is Fresh and Ready for you to cook. Complete with sides and a dessert for your enjoyment with family and friends during this wonderful time of year. IMPORTANT DELIVERY NOTE: Delivery is scheduled for the early afternoon of Monday December 24 or Monday December 31 and requires that you be home to accept delivery. If you are not able to be at home, please let us know to make alternative arrangements. Thanks, Maria. It shows in your dinners how much you love creating great food!! My family loved the dinner. You have a new regular customer. Absolutely delicious. The meat was so tender and the Peppercorn sauce was so unique. I consider myself a gourmet eater, and I have to give a Five Star to this meal!